The story of my 2,300 mile solo adventure down the mighty Mississippi. My name is Bruce Nelson. I fight wildfires for a living, based out of Fairbanks, Alaska, where my smokejumper friends call me Buck.In the fall of 2000, I’d been fighting wildfires for well over 20 years. I realized that it was time for me to take a summer off to recharge my batteries and to enjoy some of the adventures I’d been dreaming about. 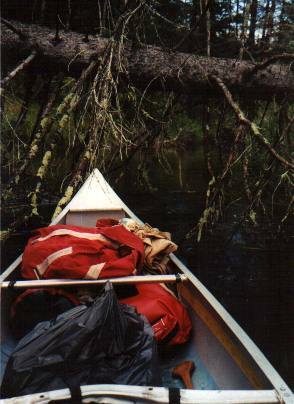 In August of 2000 I left for six weeks alone in the Alaska wilderness (see photos here.) During a fall and winter of travel, writing and planning, I decided that I’d attempt a thru-hike of the Appalachian Trail. The “AT” proved to be one of the greatest adventures of my life. It went so well that I realized I would finish with nearly two months to spare. Along the trail in Maine one day, a hostel owner lent me his canoe.Out on the lake, I paddled along and gazed at Katahdin, the spectacular mountain marking what would be the end of my hike. 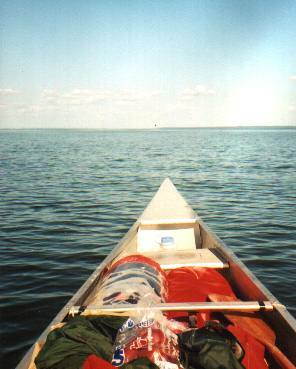 It was then that it struck me that a long trip by water might a be perfect follow-up adventure. 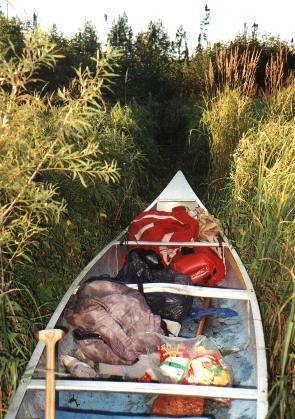 A canoe trip would be a totally different type of adventure, but where? How about the Mississippi? How long would it take to do the Mississippi? Can you even paddle the whole river in an open canoe? What kind of canoe would I need?I had a couple of days of rest in Millinocket, Maine, and there I had time to do a little research on the internet. 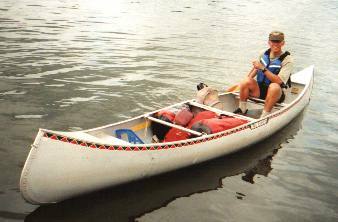 From reading two or three accounts from other canoe trips, it looked like, if the river was high enough, (and therefore fast enough) I’d have time to make the journey in the 2 1/2 months left in my summer. Sounded good to me! Below you will find the beginning of some of my photos from the river. Included are some stories and information about the adventures I encountered along the way. Although I didn’t run across the countless beaver dams I’d heard of, I did run across many trees across the river. It was obvious not many people canoed this stretch of river. Nearly always though, I could find a safe way through without having to portage. There were a number of low bridges the first day or two, and even this culvert. 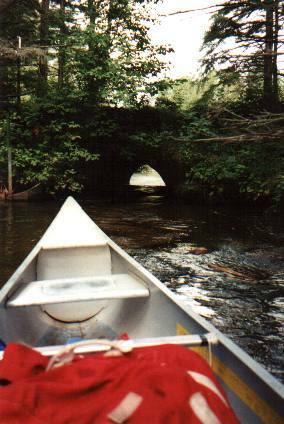 Normally, you wouldn’t think of having to lay down in your canoe as the whole Mississippi River runs through a culvert! The early part of the river was the most difficult, confusing, and interesting. Occasionally the river would “braid out” into several different channels, eventually disappearing into the alders or grasses. Here’s a spot where I was forced to drag my canoe cross-country to a better channel. There were other stretches between Itasca and Bemidji where it was even worse. The river would disappear into cattails and “floating bog” where it was too spongy to walk on and but still impossible to boat through. I spent hours floundering half-in and half-out of my boat, looking for the channel. 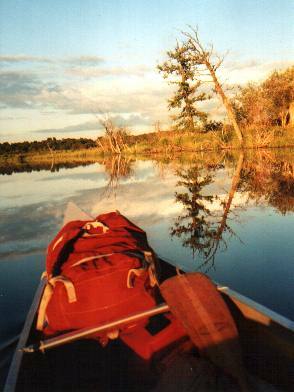 At one time I resorted to taping a mirror to the end of my paddle, which I held aloft to look for the river! I got extremely close to this mink! 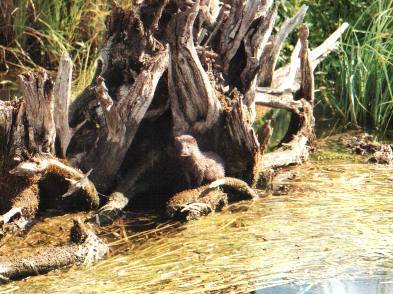 I also saw bands of otters and deer frequently on the upper river. One day I saw what I took to be a black lab swimming across the river. It turned out to be a black bear! I also saw raccoons swimming the river. Hundreds of miles downriver, I saw deer swimming across where it was a mile or more wide. The wonderful light is what I’ll remember most about the river. I saw many awesome sunrises and sunsets, including this one as I approached Bemidji just as a storm ended. I especially liked the river in the evening, with the beautiful low light reflecting off the glassy water. 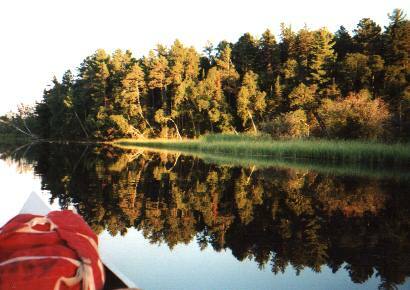 The Mississippi in northern Minnesota flows through some stretches of beautiful wilderness country. 3 More Pages of Photos and Stories Follow! It was nearly 10 miles across as the crow flies. Crossing such a big lake in an open canoe is asking for trouble, and has killed many people through the years. Do as I say, and not as I did! I crossed after listening to the radio and watching the weather, and because it was the warmest time of year. By the way, I ALWAYS wore my life jacket when out on the water. Click here for facts about planning a Mississippi adventure of your own. I was planning on undertaking the Mississippi River expedition next year and I was wondering if you could e-mail me with some advice on what to bring and such. I’m just brimming with excitement in merely planning the adventure and can’t wait to hear from people who have already completed the trip. Thank you! You have good reason to be excited! I’ve spent many hours writing up what I consider to be some of the most important information to know on my website here, so please read through all the Mississippi pages to learn what you can, then read through all the questions and answers on my blog. I’ll be happy to answer any remaining questions you have here.